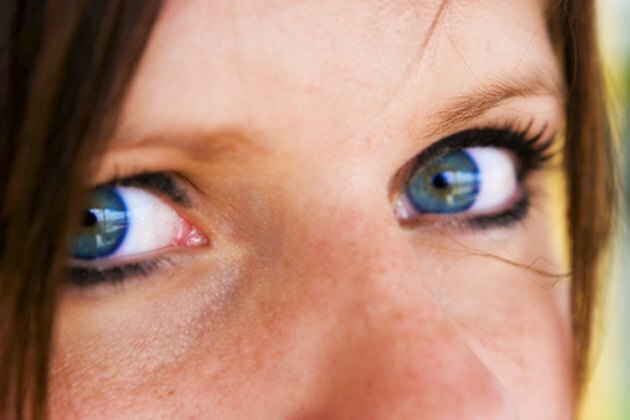 Veins under your eyes can make you look old, tired and uninterested in what you are doing. Usually the cause of veins under the eyes is from old age, but sometimes they are a hereditary trait. As you age the skin becomes thinner, which reveals the veins under your eyes. These veins under the eyes often appear as dark circles. There are ways to help reduce and fade the veins. Eat whole foods that are unprocessed and do not contain added sugars. Try to purchase foods from an organic food store or family owned farm. Eat foods such as fruits, vegetables, whole grains and lean meats to get the proper nutrients and antioxidants your body needs. NaturalEyeCare.com says this will cause your skin to look fuller, healthier and make the veins under your eyes less noticeable. Place a cold washcloth over your eyes for about five minutes a couple times each day. The cold cloth will help constrict the blood vessels and make them less visible. It also will help reduce swelling and puffiness. Put special facial sunscreen on your skin every day before going out into the sun. The sun's UV rays can cause you to lose your elasticity in your skin, which will make your veins more prevalent. Sunscreen will protect you from the sun's UV rays and help keep your veins less visible. Cut up cucumber or potato slices and put the slices over your eyes for 15 to 20 minutes. After 15 to 20 minutes take the slices off your eyes and apply a moisturizer to the skin under eyes. It will help make your skin look healthier, brighter and lessen the appearance of veins under your eyes, according to HomemadeMedicine.com. Massage the skin under your eyes with almond oil every day before you go to bed for about two weeks. According to HomemadeMedicine.com, the oil will help remove the appearance of dark veins under your eyes and provide good source of nutrients for your skin. Natural methods can take time to have a full effect. Wait about two to three months before you start to see results. Consult your doctor for the best ways to treat the veins and dark circles under your eyes.